If you don't feel confident working on your bike, we suggest you take it to a local bike shop for final assembly & safety checks. Faster than a Hybrid or Comfort bike, more comfy than a Road Bike! What is it? It's a Cafe Bike!! Cafe bikes are road bikes with flat bars and adjustable stem so you can ride with more comfort and control than a regular road bike and far greater speed than a hybrid or comfort bike. 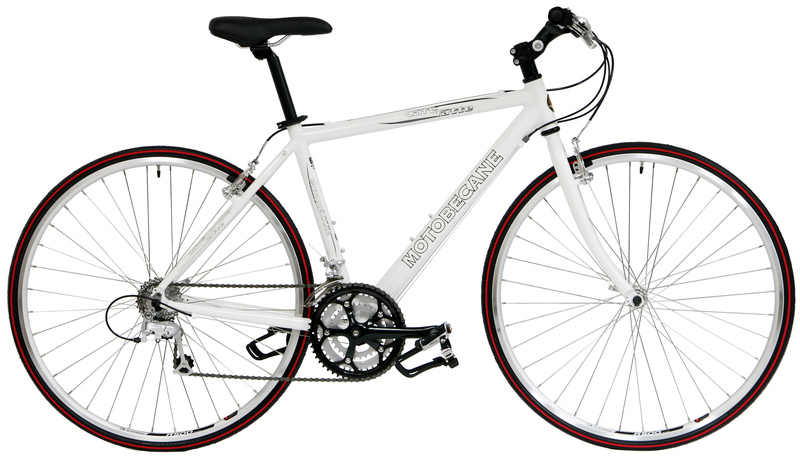 The Motobecane Cafe Latte comforts you with the superior ride of a meticulously handcrafted Advanced Butted Aluminum frame and Triple Butted Chromoly Fork, Alex-R500 wheels and Shimano components. The smooth ride and stable handling is perfect for those relaxing weekend tours of the countryside. Sizing is a personal preference. Bikes come up to 90 percent assembled. We suggest you take it to your local bike shop for final assembly & safety checks.